You can check out the new Credo here and the post about all the updates here. The goal of this post is to talk about the entrepreneur journey behind it all. I launched HireGun.co, the old domain, on March 22 2013, almost exactly four years ago. I started it because I thought there was an opportunity in the space to provide a super high quality service to businesses who are looking to hire a consultant or agency. But I just sat on the potential for two and a half years as I finished up at Distilled then went inhouse for a while. I wrote about why I started working on it fulltime here, so I won’t rehash it in this post. I couldn’t forget about HireGun Credo for the in-between years, though. I knew once I got laid off that I had to give it a shot, to let myself see if I could will this business into existence in spite of my shortcomings. 18 months later I’m still here. So what’s the lesson? If you can’t stop thinking about it, give yourself the permission to see if it could work. Remember, the best time to plant a tree is yesterday. The second best is today. I feel like I’ve learned a strategy that is going to serve me well for the rest of my life, both business and personal. Life and business are an adventure. I’m a big fan of Game of Thrones, Lord of the Rings, and the like so I’m going to use a slightly nerdy and fantastical reference for what I’ve learned. In the above mentioned shows and movies, there are always dragons. If you want to continue the journey, you have to kill that dragon. So this story is about dragons. And it’s my own story. What Dragons Did I Kill? Along the way I’ve done countless code deploys, some small and others much larger. I haven’t shipped a major update in almost a year though because of numerous life occurrences such as moving away from California, traveling the world, and settling in Denver. And now it’s time to take it to the next level. Because I got laid off, I was bitter. I felt, in a way, violated and that trust was broken. Getting laid off is worse than just a breakup – it’s like being cheated on and kicked out of your house on the same day. So I went into self-protection mode. I said “I will never again let someone tell me that I am no longer making an income.” I diversified my income streams across software, consulting, and coaching. And I’ve done well. I reached a point last year though where I realized I couldn’t do it all on my own. I was working way too many hours and doing way too many things. In April of last year I hired a part time WordPress developer who helped me get the first version of Credo Pro operational. Over time we made some changes, mostly tweaks to the email system. That was fantastic. 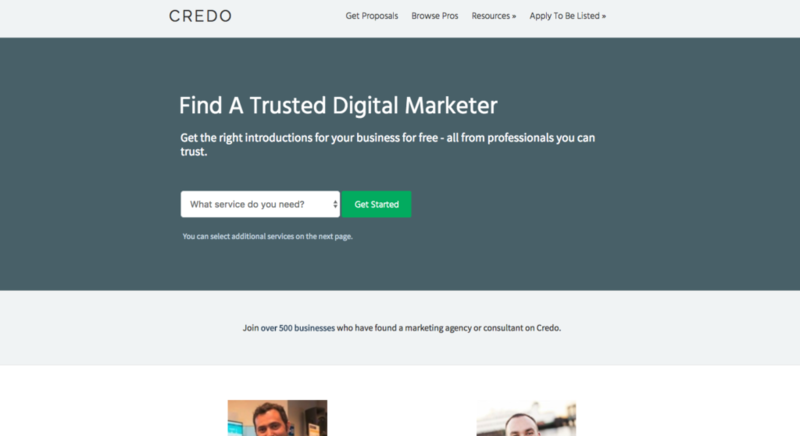 For a period last year I worked with a freelance writer to try to outsource some of the writing/content marketing happening on Credo. She’s a fantastic writer, but I realized that in order to really make the writing + promotion thing work you have to hire the right person and be very explicit about what the job involves. I stopped that after about 3 months. Right now, I am in a very good place personally (I’m healthy physically and mentally), business is good, and I have a clear vision for what Credo can become. I am continuing to work with the same developer and I’m hiring an assistant to help out with a lot of things that I currently do. It’s going to be game changing and I’m excited for it now, which is always a sign to me that I’m heading in the right direction. Historically I’ve been really good at publishing my thoughts on the Internet. My mantra has been if I’m afraid, then I’m heading in the right direction and should do it. So I hit publish and keep on moving. Not surprisingly, some of the posts I’ve been most scared to publish have been the most popular. So I guess the lesson is to scare yourself. Come across those dragons. Then push through it. You’re never going to reach the end of your adventure (if there even is one) until you’ve gone past your dragon. You might have to fight (think: you’ll take some knocks and make tough decisions). You might lose your sword and have to reclaim it (think: things go the wrong way and you change strategy a bit). You’ll probably have to run for a bit (think: working long days). I’ve been afraid at times to ship new product. It is scary to build something and then put it out there in the world for others to see. You cannot please everyone all the time, and sometimes to keep moving forward you have to recognize that what’s new won’t fit everyone you’ve previously been serving. And that’s ok. Kill that dragon of people pleasing. I’ve always been of the belief that there are three types of people and most are a combination of two mainly – discoverers, implementers, and sharers. I’ve always considered myself a Discoverer (new ideas, new strategies) and sharer (telling others about it), so that meant that I’m not an operator. I get bored pretty easily and don’t think I’m good at operating a business. I realized the other day that I’ve been running my business for the last 18 months, and maybe “operating” can also be thought of as doing the things needed to push the business forward. It doesn’t have to mean finance, book keeping, paying invoices, paying vendors, and all that. Getting over my perceived fear of operating meant reorienting myself to how businesses actually work, not how I thought they work. And I couldn’t learn that working for someone else. The final dragon I had to slay so that I could keep moving forward was the fear of asking others to help me. I’ve always, since I was a young boy, prided myself on being self sufficient. I learned a lesson very young that if you want/need something, you need to do it for yourself. No one else is going to help you out. I’ve now realized that that lesson is wrong and it’s taken me years to start unlearning it, with a lot left to unlearn. Right after my exit from my last employer I was a bit bitter and shell-shocked. It had been a very hard few years for a number of reasons, and I needed to not have anyone who could really disappoint me or throw me under the bus. But a year in I hit a nexus point of product needs that were beyond my existing abilities (and would be for some time), a business that needed me more within my zone of genius of marketing and writing and sales, and a desire to have a better work/life balance and integration where I wasn’t working too many hours. I started off small – hiring a very part time freelance developer to build some things, a writer who didn’t really pan out too well but that’s ok, and then scaling up from there. Now I’m looking to hire a part time executive/admin assistant who will help out with a lot of business-related tasks and probably do some account management as well. Exciting times, and I’m glad to have that dragon behind me. Business is fun. Entrepreneurship is fun and hard. I’m in Mexico as I write this with some agency owners for a five day mastermind retreat, and it’s one of my favorite weeks of the year. What you don’t see is that when my wife and I landed on Saturday for 24 hours of vacation, I immediately had to jump on my computer for 30 minutes poolside to fix a few major bugs. Then I went and relaxed. I guess we’re all always a work in progress.